Even though I work from home and have plenty of time to cook, I almost always find myself scrambling to get something together for dinner. Especially this time of year with all the holiday craziness, I just don't seem to be able to get my head on straight. Enter: my trusty slow cooker! 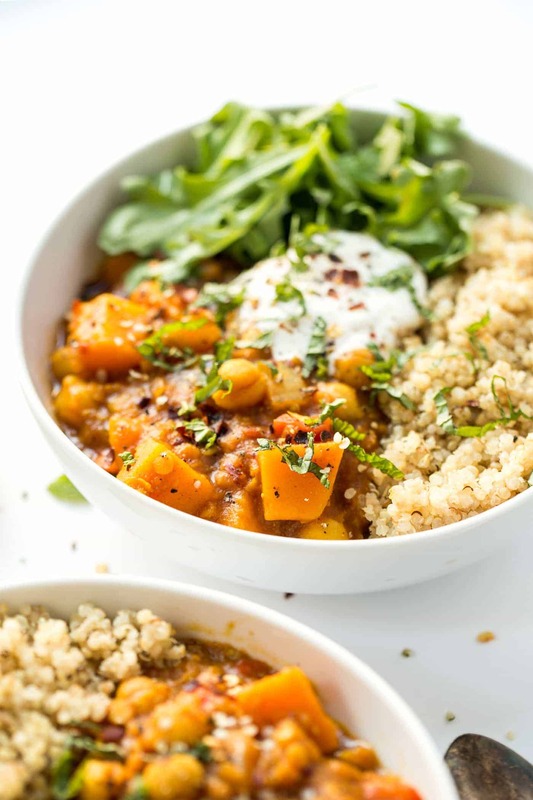 Slow cooker meals always save the day (have you tried my Slow Cooker Coconut Quinoa Curry yet!?). You just throw everything into the pot, turn it on and go about your business. 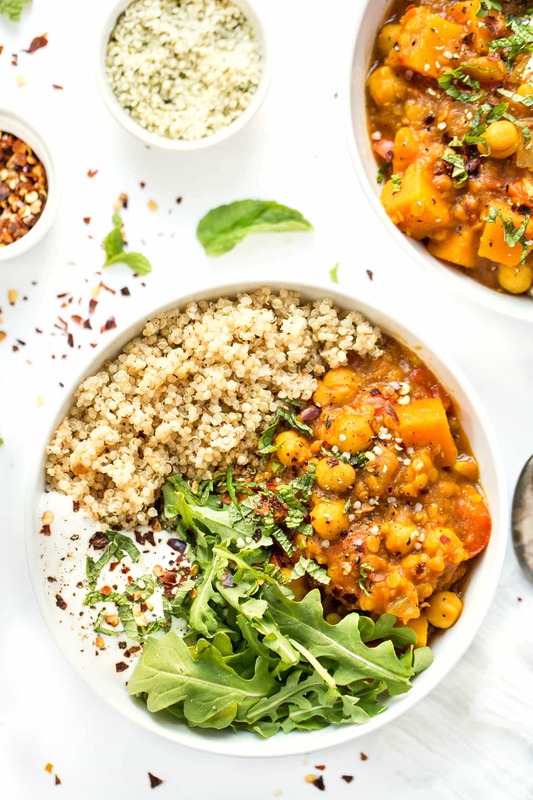 And today we're making a fragrant and nourishing slow cooker Moroccan chickpea stew with butternut squash! How good does that sound!? I've seen these stews made before where you saute all the veggies together, but honestly, I found the flavor was equally as good when I just tossed them in my slow cooker. So that's what we're doing. We're simplifying as much as possible. So what do we need? Let's talk about it. 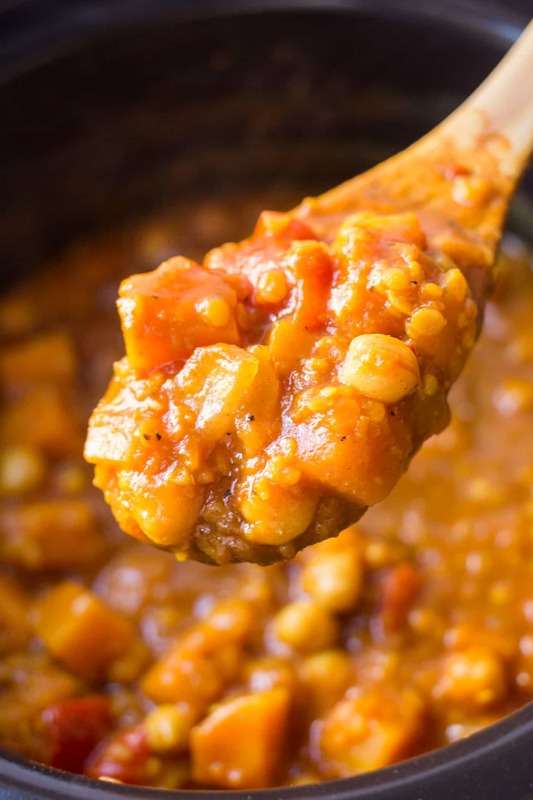 We're going with chopped onion, minced garlic, sweet bell peppers, tender butternut squash, creamy red lentils and plump little chickpeas to round it out. 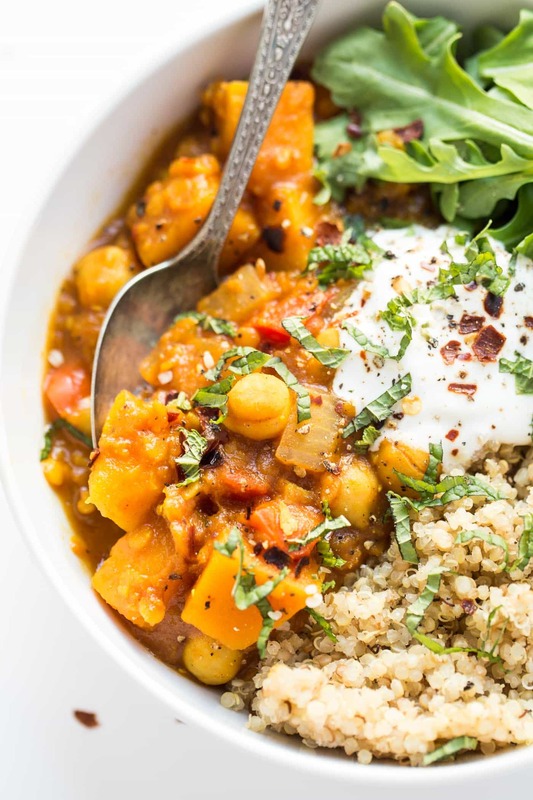 But what truly makes this a Moroccan chickpea stew is the aromatic spices! 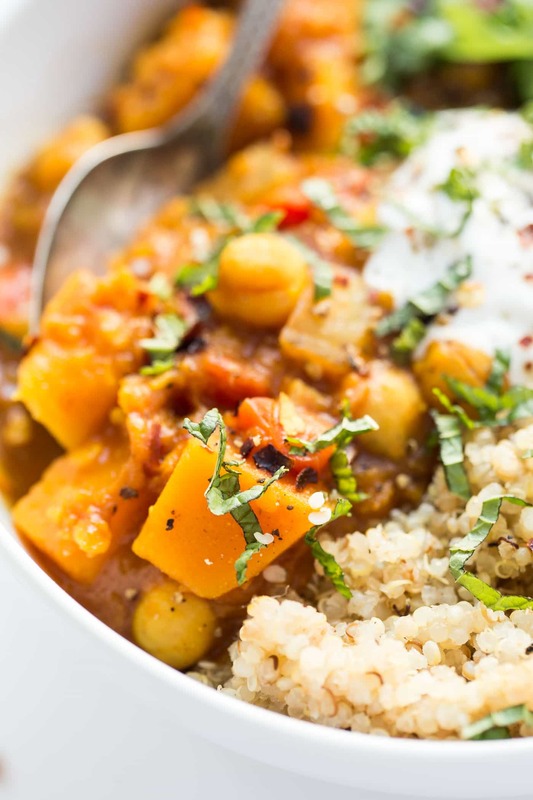 With a combination of turmeric, cinnamon, cumin, paprika and pepper, this stew comes alive with flavor and spice! I also sprinkled in a little cayenne pepper for heat, but that's totally optional. You know how much I love to add a kick to my recipes! For serving, I kept it super simple. Do you like cooking in a slow cooker? I'd love to hear some of your favorite recipes! I'm looking to add more dishes to my slow cooker library, so send em my way! Hi. First and foremost, thank you for the recipe! It was just what I needed. But (there is always a but…), I am not a cook. In actual fact, I hate cooking more than having a Root Canal. When I find a recipe, I follow the instructions to the letter. 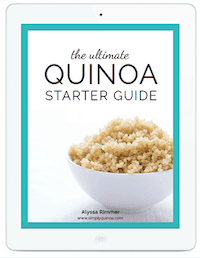 So I have no idea how much quinoa is needed (or even how to cook it). 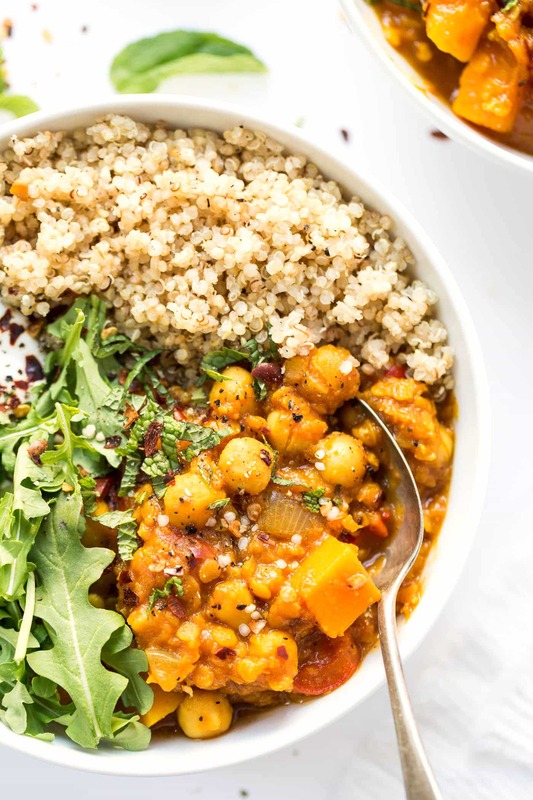 Could you include some indication of how much quinoa is required for the Slow Cooker Moroccan Chickpea Stew (say, for two people)? Again, thank you for the recipe! If i wanted to make this in the Instant Pot how would you suggest altering the recipe? I haven’t made this in an IP, so I have no clue! I would say maybe increase the liquid slightly? I’ve never made a stew, but I do have a chili recipe that cooks for about 12 mins. I plan on using frozen “steam in bag” butternut, do you think I should adjust the liquid at all? I’m so excited to try this! I don’t think you’ll need to! I absolutely love this recipe! I slowcooked chix thigh in bone broth & used 1.5 cups of the leftover bone broth with 1.5 cups of veggie broth as recipe calls for & added the shredded chix at the end. Also, for a little less carbs, I served with riced cauliflower instead of quinoa. Will make again & again! So, so happy you enjoyed it! I don’t normally leave reviews of recipes, but this was AMAZING. Thank you! I think so for the slow cooker! And yes, the beans are dry 🙂 Hope you enjoy it! Always a win when the whole family loves it! I followed it almost to a tee, winging the salt and doubling the turmeric for extra curcumin power;) Threw on some dried currants and chopped almonds before serving as well. It was really yummy- thanks for sharing the recipe! Hooray!! So glad you all enjoyed it 🙂 And love the additions – sounds awesome! Since you are cooking this for so long in the crockpot, can you add chicken to it and shred it towards the end? can i use same cooking times and method with half quantity of dried chickpeas and lentils instead of tinned? i’ll be adding fresh birds eye chilli too, though not exactly moroccan style & serving with black curly kale. I’d like to add chopped Swiss chard. When do u recommend adding it? I’m wondering if I could prepare this and freeze it for cooking later? Can I add spinach? If so, when would I add it? At the end? Thank you. Is the calorie content taking into consideration the quinoa/yogurt/greens garnishing? It’s not 🙂 Just the main stew! 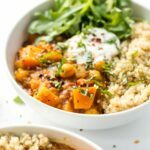 I have a big bag of frozen pre-cubes butternut squash in my freezer, do you think that will work well for this recipe? Made this for dinner tonight. Prepped everything last night and cooked in crockpot today. I added 1/2 tsp of cayenne pepper. I love stews like this because you can throw in vegetables you have hanging out! It was delicious! Thank you for the recipe. yum!! Definitely going to add cayenne next time! Making this tonight! Looks yummy. Was your coconut yogurt coconut flavored yogurt, or plain yogurt made with coconut milk? Afraid the coconut flavored will be too sweet….? Thanks! It was plain yogurt made from coconut milk 🙂 I don’t find it to be sweet at all, more like a greek-style! Ok thx! Yogurt made with coconut would be perfect- i was talking about Greek yogurt that was coconut flavored. Waaaaaay too sweet! Tonight we will try it with plain Greek yogurt. My house smells FABULOUS!! Absolutely delicious and easy! I amended the recipe very slightly by added carrots. So unbelievably good! I added extra lentils because we love our protein. Extra bonus…the house smelled amazing. Thank you! hooray!! So glad you all enjoyed it! and yay for extra protein!! Sorry you felt that way! There are certainly different levels of taste buds, which is why I always recommend that you taste as you go. You can always stir in more spice before serving! Is pure tomato sauce the same as UK tomato puree? I’m thinking of making this tomorrow! Made this last night. It came out delicious! I doubled the recipe, doubled the spices, added double lentils, and some extra peppers, 1 zucchini, 1 summer squash, and about 2tsp yellow curry powder. I also made my quinoa using red quinoa and added basmati rice. It was very hearty, filling, and delicious!!! Can I use canned lentils? I keep reading lentils but Im not sure if you mean canned or dried? Thanks! Cant wait to make it! do you have an idea of the calories per serving by chance? Unfortunately I dont have a slow cooker but would love to try this! What are instructions for cooking this in a regular pot on a stovetop? I was wondering if this recipe can be frozen? Am I missing something? Where is the actual recipe? What is the green garnish you use on top? Looks like mint to me, is that correct? It was mint – yum! Hi, I tried this for dinner tonight but I was pressed for time so I sauted the onions and peppers in my electric pressure cooker then threw in the rest of the ingredients. I set the pressure cooker on high pressure and the time for 10 minutes. It was amazing!!! The lentils were still a little firm but they added a nice texture. We will definitely make this again. Side note: I made the quinoa in my rice cooker and it turned out wonderful too!! I’m making this now in my electric pressure cooker and going to try 12 min. since you said ten still had the lentils a little firm.. Did you use quick pressure release or natural pressure release? Sorry I didn’t see this question sooner. I did quick release, if I had used natural release at least a few minutes the lentils may have been a little softer. I quick released so the the squash wasn’t overcooked. Wow that’s amazing!! I have yet to try a pressure cooker, but only 10 minutes?! I’m tempted….! I don’t know if you’ll see this after so much time but did you ever try it on the pressure cooker? I’ve made it a few times since and we love it. Hi I was wondering if you know how many Weight Watchers SPs this would be. Hi Alyssa, I made the stew Sunday night and it was divine! I also made the lemon quinoa. It was so good. Thank you for the recipe. I’m so excited to try out more of your recipes! Hi. This looks amazing and hoping to make it this weekend! Have you ever considered using riced cauliflower? I love quinoa, it’s one of my favorite ingredients! I haven’t, but it would be delicious! Can you give me any guidance on how much squash to use? Either by weight or volume. I really don’t know the size of a “small” butternut squash. I’ll be using part of a larger one. I’d say go with about 3 cups of chopped squash! How important is it that I use red lentils? I could not find them at either store I want to. I have brown lentils. Will that be ok? 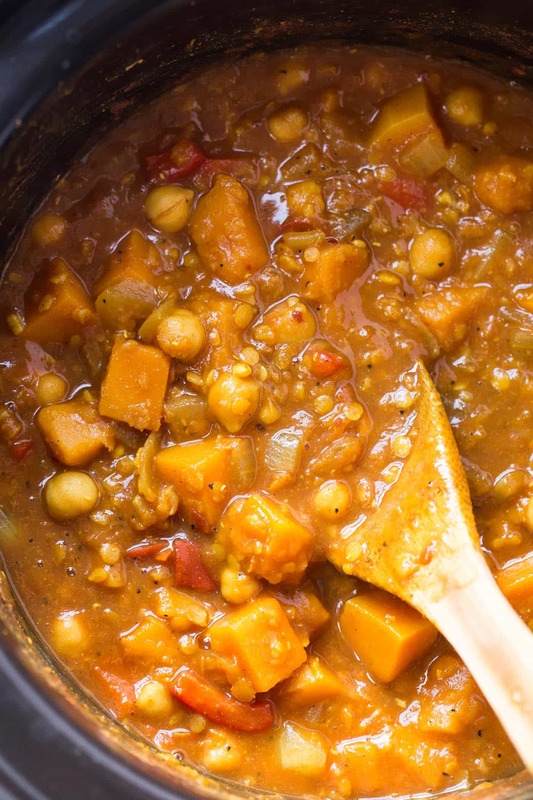 I made it yesterday with the brown lentils and added a medium size sweet potato. I also used 4 cups of broth bc that’s what came in the container. And my squash was on the large size. I made it on the stove bc I waited too long to start it in the crockpot. Next time I will do it in the crockpot and it will probably work fine with a whole cup of lentils. This was great. The whole family liked it. We didn’t add and yogurt but the family had hemp seeds and I had arugula and hemp seeds. It also made enough to feed us for like a week, but I’m going to freeze some of the leftovers. Thanks for the recipe. It was so good. made this dish tonight and LOVED it…even my (pick) 4 year daughter loved it! This recipe is fabulous! Thanks! I added some carrots. Do the lentils have to be soaked beforehand? I made this in the instantpot – I used the slow cooker function but cooked on high for 3 hours. Next time I would have done 2 hours because the butternut squash was almost pureed it was so overcooked. But the flavors are good and I will make again. Thanks! What can I substitute the coconut yogurt with? Allergic to coconut. Slow cookers are the best. I prep tons of raw and vegan dishes so when I turn to the slow cooker for some meals, you can imagine how my life just gets way more simplified while still remaining tasty and healthy. Have you tried lightly frying the cumin seeds before? I find it really opens up the flavor of the seed before cooking and adds a little “pop” to the dish. Can’t wait to try this! Especially with the coconut yogurt, what a great addition. I actually don’t toast spices very often, but I agree that it adds a TON of flavor! Hope you give this one a try, it would be delicious with toasted cumin! It’s mine too!! I love how the bitterness complements so many different things! Aww thanks!! And yes, it’s seriously the COZIEST!